As "Life's Too Short" reaches its season finale Sunday, Ricky grows into an effective extra in his own show as he mines more laughs from the sad state of celebrity. Ricky Gervais's "Life's Too Short" is growing on us. Ricky Gervais, from playing the clueless boss on "The Office" to skewering celebrities at the Golden Globes, can come off as self-centered, obnoxious and too loose with his tongue. But Gervais' entertainment persona masks a performer who may be at his best as an extra in his own show. "The Office," after all, ultimately centered on the love story between Dawn and Tim (the British forerunners of Pam and Jim) – even if Gervais' relentlessly grating David Brent tried (too) hard to be the star of the workplace. 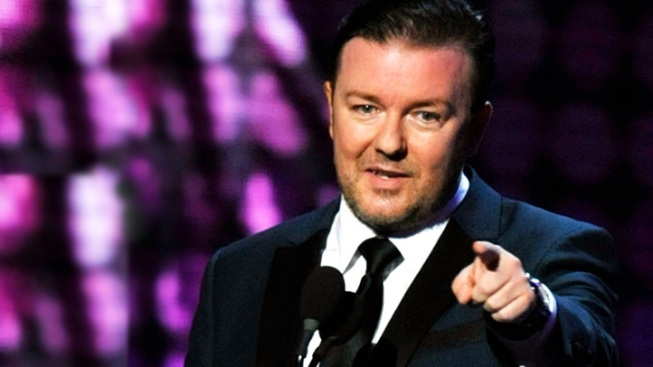 In "Extras," Gervais' frustrated actor character provided a bigger stage to real-life celebrities in a show that offered a caustic take on modern fame. The star of "The Ricky Gervais Show" and "An Idiot Abroad" isn't Gervais or his gangly comedy partner Stephen Merchant, but Karl Pilkington, a hapless misfit who refuses to change even as he spouts bizarre theories on evolution. As his latest program, "Life's Too Short," reaches its season finale Sunday, Gervais is coming up big as a deceivingly generous performer intent on mining more pointed humor out of the sorry state of celebrity. The HBO series, starring actor Warwick Davis, a dwarf best known for roles in "Willow" and "Star Wars" (he portrayed an Ewok), got off to a somewhat slow start. But the show has proved a strong amalgam of Gervais' past work and worthy addition to his comic cannon. Like "The Office," the story of down-on-his-luck Davis is told in mockumentary form and features a would-be scene-stealer who can be his worst enemy. Like "Extras," the show is filled with big-name actors playing (hopefully) exaggerated versions of themselves – an insufferable Johnny Depp humiliating Davis during a strange method-acting exercise and a spoiled Helena Bonham Carter literally treating him like garbage, ordering him dropped in a trash can on a movie set. Like the Pilkington-based shows, Gervais and Merchant are on hand to play sometimes cruel comic provocateurs – in this case as reluctant advisers to Davis, who runs an acting agency for little people but grabs what he thinks are the best roles for himself. As with other Gervais efforts, the show is rooted in the often cringe-inducing comedy of the uncomfortable. We see Davis dupe himself into thinking he's the guest of honor at a "Star Wars"-themed wedding – only to get stuffed into a makeshift Ewok costume (an emptied teddy bear casing). We see Davis’s pathetic attempts to climb a bookshelf to retrieve an old trophy – refusing to let his estranged wife or her divorce attorney/apparent boyfriend help. We see him head into a science fiction fan convention convinced he’s the star of the show – only to leave with a leftover pile of unsigned headshots and a crushed ego.